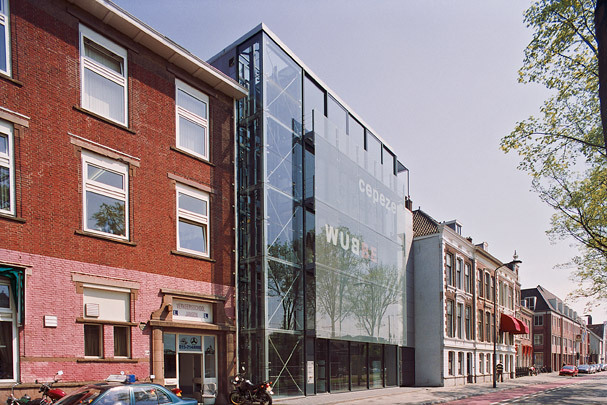 Cepezed’s own office premises slip into an existing urban elevation with a slight shift in the building line. The architects’ efforts to achieve a simple, virtually column free space for maximum freedom of organization and a renewable, largely passive energy concept led them to use a steel frame construction with all-glass facades. The front has an additional glass screen that protects it from excessive sunlight and wind loads and reduces traffic noise. All facilities and circulation zones occupy a narrow strip along one of the sides. Behind the streetside office building is a column-free single-storey work shed.